Southern California, Malibu to Dana Point and the Inland Empire, Pasadena to San Gabriel Valley. I charge $20.00 for gas, I leave the reward up to whatever the people can afford / think is fair, based on their ability to pay. I'm an expert at metal detecting and treasure hunting, having nearly 35 years of field experience. I spend a great deal of time in the Orange County area pursuing my hobby at Huntington, Laguna and Newport Beaches. I am a member, in good standing, of the West Coast Prospectors and Treasure Hunters Club, Riverside Treasure Hunter’s Club, and the Los Angeles Historical Bottle Club. 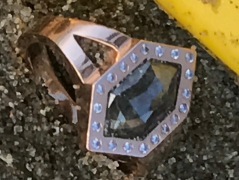 I am adept at water and sand recovery, and specialize in recovering precious metal items lost at beaches and lakes during recreational activities in or out of the water. I can search in sunlight or in darkness. 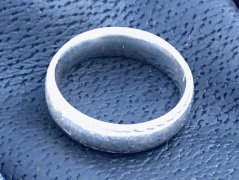 I have also spent several years successfully engaged in finding items such as keys or rings lost at parks or in people’s yards located in the California Coastal Region. In addition, I bring experience with fire recovery. I assisted Claremont Grand Prix, Laguna Beach and Oakland fire victims in recovering items from the affected areas by using sifting screens and metal detectors. I have been fortunate enough to find nice things during my long career, and participating in TheRingFinders.com service allows me a means to provide a compassionate service to the distraught. On Thursday, February 7, at about 4:45 p.m., I took my 7-year-old daughter up to Mt. Baldy to make snow angels in the fresh 10-12 inches of snow that had recently fallen. We made our snow angels and then headed down the mountain to the animal shelter where we try to volunteer every Thursday. While visiting with the shop-owner next to the animal shelter, I began to relate a story about my wife, and right as I started talking I realized my wedding band was gone. I suddenly couldn't breathe as the shock knocked the wind out of my senses. The shop-owner tried to offer encouragement and consolation, but I was unable to shake it off. I proceeded to walk over to the animal shelter in a kind of zombie stupor, not wanting to disappoint my daughter's wanting to spend time interacting with the different cats and dogs, even though my instinct was to race back up the mountain and retrace our footsteps. I walked in, told the manager of the animal shelter about my lost ring, and she immediately told me about a guy who volunteers there and who also works for a group called The Ring Finders. She pulled up Jeffrey Levy's page on Ring Finders website and gave me his number, and I called. I told Jeffrey about my situation, and after listening and asking a few questions, he said he would meet me back up on Mt. Baldy at 8:30 a.m. Friday morning. He even chose to postpone a doctor's appointment he'd originally scheduled for Friday morning in order to meet me. Jeffrey was friendly, professional, and compassionate as he talked me through the different scenarios for rings getting lost in the snow and ways to find them. He asked if I might have taken any photos or video of my daughter and I making snow angels, and thank goodness he did. I pulled up a video my daughter had taken of me making my snow angel, and from it, Jeffrey was able to surmise the general location of the ring. We walked through the bracing 30 degree chill to the spot where I'd made my snow angel. Jeffrey quietly put on his gear and went to work with his metal detector. In less than a minute, he found my wedding ring. Again, I felt a kind of shock, but one of overwhelming relief. He handed me the ring, and for a few seconds, I could not stop the tears. My wife passed away a year-and-a-half ago. 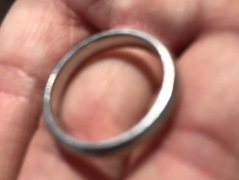 It was a slow, soul-wrenching process, and my wedding ring had been one important way for me to somehow still feel connected to her. I could not have been luckier that Jeffrey decided to meet me on a terribly cold morning in a place covered with ice and snow. It's as if the snow angels my daughter and I made the day before had been reincarnated in the form of Jeffrey. His selflessness, humility, persistence, and know-how are the trademarks of a great human being. I am forever in his debt, and I thank you for putting Ring Finders together. My name is Calvin and I lost my ring out in a park in Rancho Cucamonga. I was having fun with my basketball team and their families in the park during a water balloon fight. At that point I was trying to shield myself from getting hit but my wedding ring slipped of my finger into the grass. I was devastated. After a few hours of looking and even a friend purchasing a metal detector we came up with nothing. I really don't like being the bearer of bad news so called my wife and told her the story. She came down and also helped me look for it but we still came up with nothing. So later that night I do a search of people who lost rings what services were they using to help recover them. That's when I discovered TheRingfinder.com saw that Jeff was not far from where my wife and I lived. I called him and scheduled a time to meet at the park the next morning around 8:30. It took him maybe under 2 hours to find the ring. My wife and I were so relieved and elated that he found it! We are so grateful to Jeff and TheRingfinder.com for this amazing service! We will definitely recommend him and this company to anyone who has lost jewelry that has sentimental value. My name is Mike, my wife Lisa and I were on our honeymoon when she lost her wedding ring in the surf at Paradise Cove in Malibu Ca yesterday. We searched for hours getting beaten up by the surf and the rocks hopelessly searching and not wanting to give up. 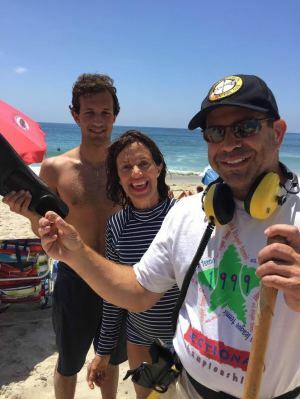 After 4 hours with no luck we made contact with the Lifeguard who recommended Jeff from your group The Ring Finders, we’ve never heard of your service but we were willing to do anything to get Lisa’s ring back. We made contact with Jeff and he explained the tides in detail to us and told us when to meet him back at the beach approximately 14hrs later during low tide. Jeff showed up, surveyed the area for a few mins then he started searching in a grid pattern pulling up a ton of bottle caps unfortunately. Approximately 15 mins later he found Lisa’s ring buried under a foot of sand already! Our minds were blown! I cannot say enough wonderful things about Jeff and his gracious demeanor, Jeff saved our honeymoon. We will be forever grateful for this moment. I take my hat off to Jeff! He saved our vacation to Huntington Beach from Philadelphia. I had taken my ring off at the beach and placed it in a “safe” place so I wouldn’t lose it. Well, as you can see, that didn’t work. I went to our hotel and asked for some help, they sympathized with me and did check to see if they rented metal detecting equipment but they didn’t. The staff was then pointing me towards renting some equipment in the town when suddenly; casually, they pulled out Jeff’s card and gave it to me. I called Jeff; he answered right away and told me he could be there in an hour or so. We meet in the parking lot and within 3 minutes he found the ring. I highly recommend Jeff, he’s a vacation saver! 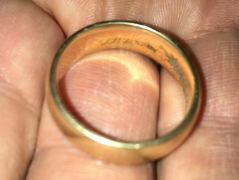 My wedding ring, which had been passed down through four generations of men in my family and had stayed on my own finger for over twenty-two years, decided to slip off of my finger and into the sand of Zuma beach last Saturday night. We thought that all hope was lost but luckily I found TheRingFinders site late that evening and first thing the next morning I was in contact with Jeff Levy. After listening carefully to my story and assessing the situation Jeff made arrangements to meet at the spot were I thought the ring might be. I marked off what seamed to be an impossibly large search area and stood back to watch while Jeff went to work. Jeff’s confidence was infectious. Even as rusty nails and old springs were pulled from the sand I could feel that it was just a matter of time before my ring would make its location known. Jeff made one full pass down the thirty by ten yard stretch of sand, which I had cordoned off, and was a third of the way back when something grabbed his attention. He waved his detector back and forth isolating one particular spot then he scooped his sifter deep into the sand. Two quick shakes and the lovely sound of clinking gold rang through the air. There it was in all its glory! My great grandfather‘s ring returned so that it my bless the union of another generation. Thank you Jeff... thank you Ring Finders. You shall remain in our family lore from this day on. "I called Jeff on Thursday afternoon after I had lost my rings on Monday morning at Capistrano Beach. He and I discussed the location and his schedule. He called me back later that night and let me know that he had rearranged his schedule so he could meet me at 7am at Capistrano Beach. On Friday morning, he left Claremont at 4:30am to arrive at Capistrano Beach by 6:15am. When my husband and I, plus our 2 children arrived at 7am, he had already found the ring. Simply amazing! We are forever grateful for Jeff's services." I received the most meaningful gift, a promise ring, from my boyfriend around Christmas time. What should have been the most happiest time of the year turned into the most tragic event that could ever happen. 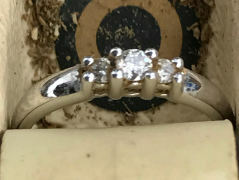 I lost my ring in my horse's stall. Trying to find my ring was like trying to find a needle in a hay stack. I was so disappointed and heartbroken that my ring was gone. I tried to do everything I could to find the ring before my boyfriend figured out I lost it. My mother came upon the ring finders and found Jeffery Levy close by. He immediately came over the next day after Christmas. Jeff found my ring within a half an hour. Finding my ring was a miracle and I am so grateful that Jeff and the ring finders came to my rescue. Thank you for relieving my worries ring finders.